Splatball is a paintball store in Minneapolis as well as an indoor paintball field. We are the largest paintball store in Minnesota. It is the place to plan your extreme paintball experience. Our facilities are designed to accommodate both paintball enthusiasts and their fans. We play, rain or shine, or snow and cold at Splatball because it is all indoors! Be sure to wear clothing you can get dirty, ’cause paintball action can get messy! Action Packed is the ideal place to plan your next birthday celebration or bachelor/bachelorette party. The eight challenging playing fields have names like City of Tombstone, Firebase Alpha, Civil War and Wooded Fields. What a perfect setting for a theme party. 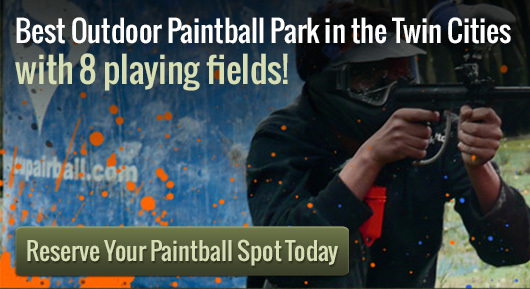 Call ahead and reserve a time for your paintball party. Party game time reservations are available seven days a week from daylight until dark. If you don’t have a party, groups that want to mix in with other players can take advantage of walk-on hours on Saturday and Sunday. Special party packages are available, along with equipment rental. Players can bring all their own equipment, but are required to use paintballs purchased onsite. We have year long season passes available that include free entry and discounted paintballs. Equipment rental is provided in a Standard package and an upgraded Premium package. Both packages include free, all day, compressed air refills. All players must sign a liability waiver and any player under the age of 18 must have their waiver signed by a parent or guardian. Games are supervised by our friendly, experienced staff.